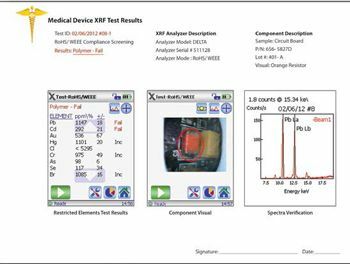 The Xpert for Consumer/RoHS, a convenient, compact & lightweight XRF analyzer for regulatory compliance programs, provides accurate Pass/Fail results within seconds. It is completely independent of an external PC and can be powered by battery for ease of transport to wherever testing is needed. The Xpert, XP-6500-CC, for Regulatory Programs is a compact and transportable X-ray fluorescence (XRF) analyzer optimized for Consumer Product and RoHS regulatory compliance programs. It has a well-lit, viewable sample chamber, touch-button operation, integrated camera, and a selectable analysis spot size. transportable for wherever and whenever testing is needed. The Xpert for Regulatory Programs is a fast, accurate, and cost effective XRF analyzer optimized for analysis of lead (Pb), cadmium (Cd), arsenic (As), mercury (Hg), chromium (Cr) and other toxic elements in metals, plastic, and mixed materials. It provides detection limits that are well within typical regulatory limits in most materials. It provides the ability to test not only at retail locations, but also at loading docks and manufacturing sites to screen imported/exported toys, jewelry, clothing, electronics, and other consumer products before they become a problem. 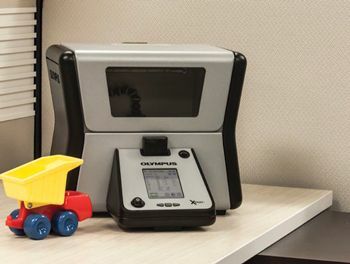 Regulators and industry stake holders depend on XRF analyzers for rapid product and component screening to monitor compliance with CPSIA, RoHS, WEEE, EN71-3 and other regulations. 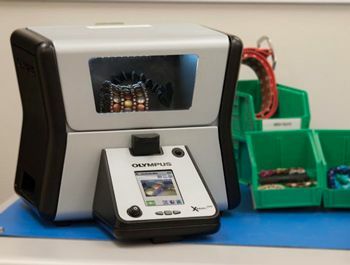 Olympus worked with stakeholders well before the July 2006 EU RoHS Directive went into effect to provide the best possible XRF user experience to meet the impending regulatory requirements. Olympus continues to follow the development of global regulations to ensure its analyzers and technology stay ahead of the regulatory requirements. And, we continue to stay in touch with industrial and regulatory XRF customers to meet and exceed their expectations with technology advancements and value-added features. Operation is simple and straightforward. An object is placed directly on the analysis window or, if small, secured in the sample holder to orient it. The chamber door is closed and the operator presses “Start” to acquire results. The small spot collimator is used for very small objects or for small areas on an object. A digital image of the object can be stored and/or sent along with the analytical results directly to a printer in report format, completely independent of an external PC. The Xpert is equipped with an articulating sample holder arm to secure and orient small samples for analysis. 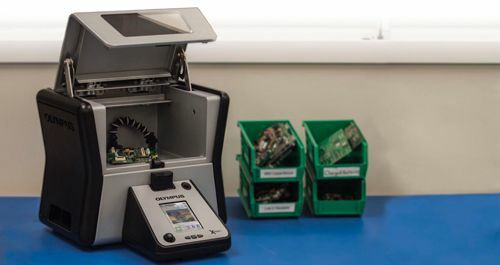 The Xpert is equipped with an integrated CMOS camera that records sample images to memory along with the analysis results for report generation. X-ray beam small spot collimation is for measurement of small components and samples. A simple tap on the touch screen in camera view activates the small spot 3 mm or standard spot 10 mm diameter collimation. An on-screen indicator shows the operator exactly where the analysis spot is focused. 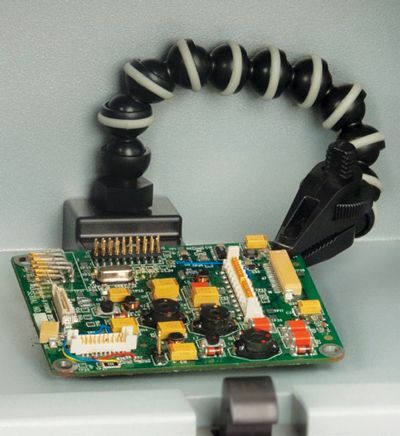 Integrated CMOS camera records sample images to memory. The Xpert PC reporting software customizes and facilitates immediate report generation, including analysis results, qualitative sample information, spectral information, and sample image. Traceable documentation makes the Xpert the ideal tool for a Reasonable Testing Program (RTP). The Xpert automatically determines sample type (polymer, alloy or mixed) and optimizes measurement conditions accordingly. It recognizes non-homogeneous (“mixed”) samples to alert the operator, which is critical for error-free operation. The Xpert also distinguishes if Pb is in the surface or in the substrate. The Xpert provides a fast, highly accurate way to determine toxic metals’ levels for quality control purpose. It allows the user to perform an on-the-spot, cost-effective, and completely non-destructive test to check for heavy metals that present in the products. In addition to Lead, the Xpert provides a high level of performance for other heavy metals of interest. The analyzers come standard with a heavy metals suite that includes Pb, Cr, Hg, Br, Cd, Cl, Ti, Fe, Co, Ni, Cu, Zn, As,Bi, Se, Sn, Sb, Ba, and other elements. The Xpert combines regulatory recommended XRF technology with multiple value-added features to provide the ideal tool for a Reasonable Testing Program (RTP), affording economy of operational costs, space, and time with a seamless integration of data and results. Xpert XRF analyzers offer accurate, sensitive analysis with easy-to-use reporting software in an ergonomic and dependable package. It offers detection of limits that are well within typical regulatory limits in most materials.